Home > Admin, Information Technology, Site, Technology	> Let’s get this party started. Everyone should try out Linux (the operating system) at some point. 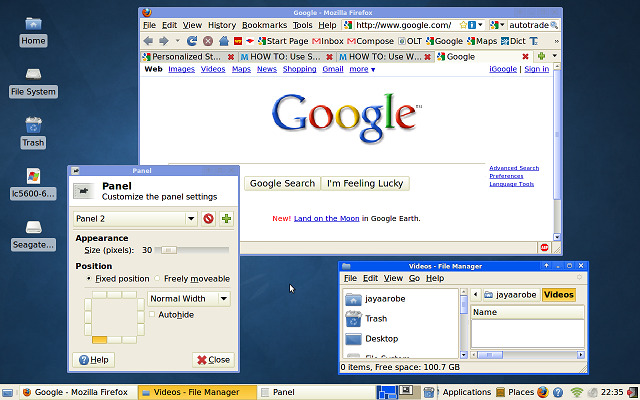 Screenshot of Xubuntu with Firefox running. For those who are unaware, Linux is the operating system (OS) of choice for heaving duty IT work, tech savvy people, and anyone who needs reliability and security. I recently installed Linux on my secondary laptop, specifically the version of Linux called Xubuntu (pronounced ex-ooh-boon-too). It’s lightweight & fast, has everything you need, it’s interface is similar to that of Windows so it’ll be very familiar to you, plus it’s free! You can even test it out on your Windows computer without installing it; it has a mode where you can try it out; it temporarily runs itself side-by-side by Windows without messing up your Windows installation in any way. When you’re done, you simply reboot and there’s no record of Linux having ever been on your computer. Try it with one click: Wubi is a program that will download and run it for you. Once it’s installing, I recommend selecting Xubuntu (it’s more lightweight and faster than Ubuntu or Kubuntu; but basically all 3 are pretty much the same version of Linux). Yes, but what have Video Games Done for You?